This week’s storytime was all about tools! I have done a construction storytime before (unfortunately prior to the start of this blog) so this was a different take on the same idea. We started with Emma Garcia’s Tap Tap Bang Bang. This book is the reason I wanted to do this theme for storytime. I am a huge fan of Garcia’s books. Tip Tip Dig Dig is one of my favorite picture books about construction and Tap Tap Bang Bang does not disappoint!. This book describes the sounds and actions of tools: “We can bang bang with the hammer and tappety tap in the nails.” This makes it lots of fun to do with a group. Next we read Whose Tools Are These? By Sharon Katz Cooper, illustrated by Amy Bailey Muehlenhardt. I like this book because it is interactive and ask the reader to guess who uses each tool. This book goes beyond the standard hammer, wrench, screwdriver tools and includes a chef’s tools, doctor’s tools and even a teacher’s tools. We had a good time discussing the type of tools we each use. A librarian’s tools are books! We closed with I Love Tools! by Philemon Sturges. This was a great book to close with. It discusses lots of tools and culminates in the creation of a bird house! I am sure there are others I am not including. Do you have a favorite tool book you like to use for storytime? 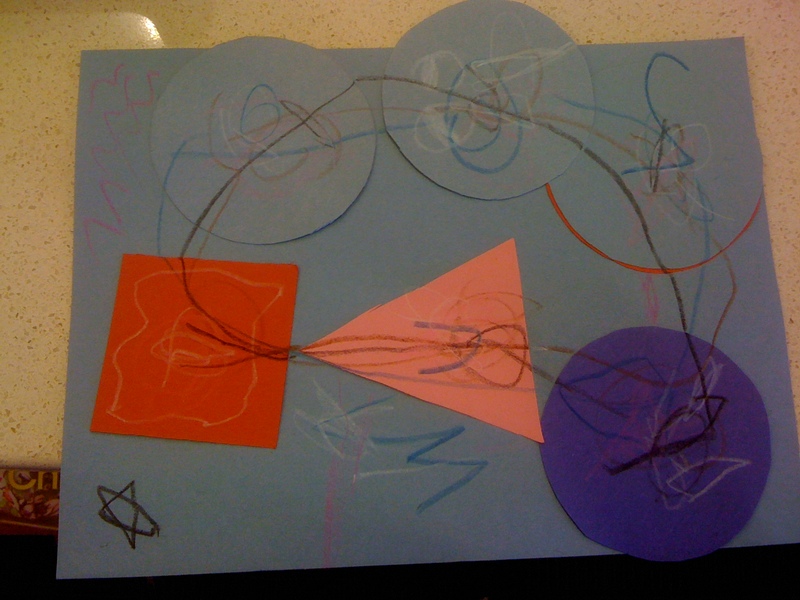 Our craft this week was a bit abstract. 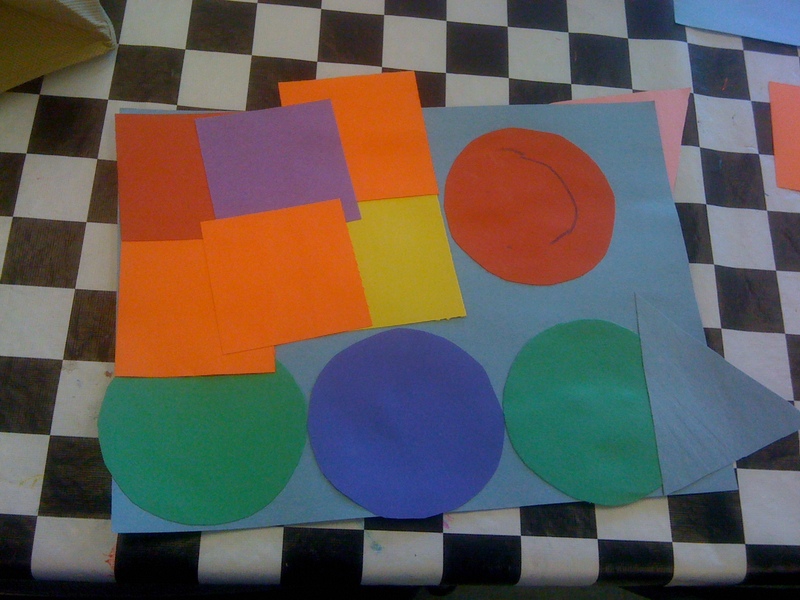 The children were given shapes and they could build something of their own on their paper. I will admit, the group needed a bit of guidance. It’s not as clean-cut as other crafts so we discussed it prior to starting and I gave them some ideas and asked them what they thought they would like to build. As a result, their creations were quite varied but they were also very imaginative. I was told this is Thomas. As in the Tank Engine. I did not get a chance to find out what this one is, but I think we can all agree it is awesome! This week’s storytime was all about rainbows and colors! I have done this theme before. It is fantastic and can be done again and again because there is no limit on the amount of books available about colors! We started today with Wow Said the Owl! by Tim Hopgood. This book was part of the owl storytime last year and I LOVE IT! This book has beautiful, vibrant illustrations and is perfect to share with a group. I have a feeling this won’t be the last time this book shows up in storytime. 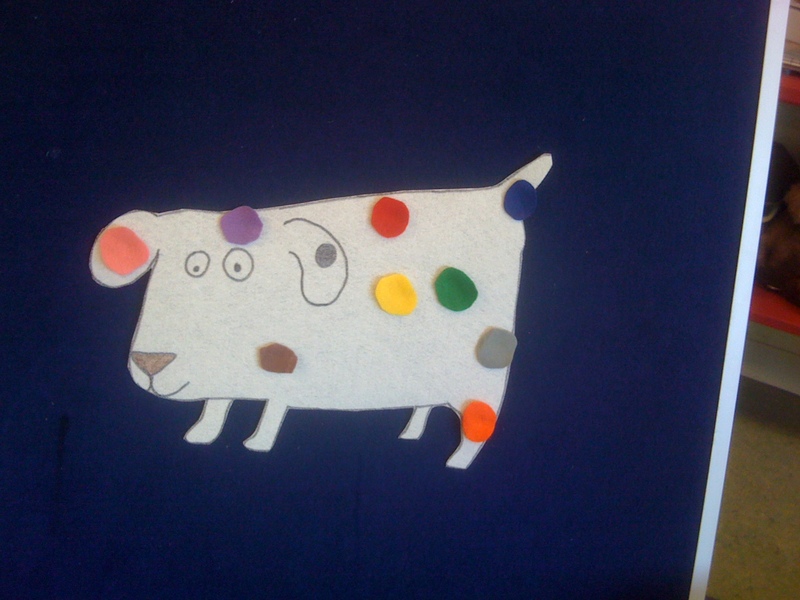 Next we read Dog’s Colorful Day by Emma Dodd. Emma Dodd’s books are made for storytime. Her books have been featured before in Pets storytime, Dog Storytime and Bugs storytime. 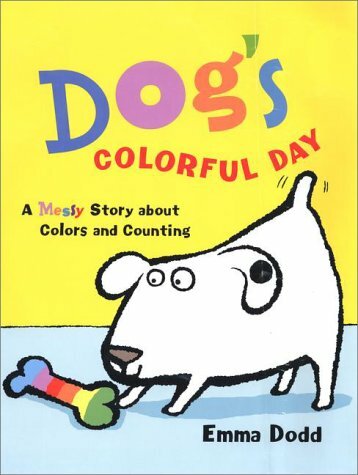 Dog’s Colorful Day is great because not only is it a book about colors, but it is also a book about counting! I am fortunate enough to work at a library that has flannel boards available. I work with a great group of creative people that make lots of wonderful things like awesome flannel boards. Today, I used a flannel board that a co-worker made to help read this book. It’s super cute! If you do not have a lot of flannel boards where you work, this one would not be too hard to make. If you want some inspiration check out my friend Katie’s blog: storytime katie. She makes lots of flannel boards in addition to having good storytimes. 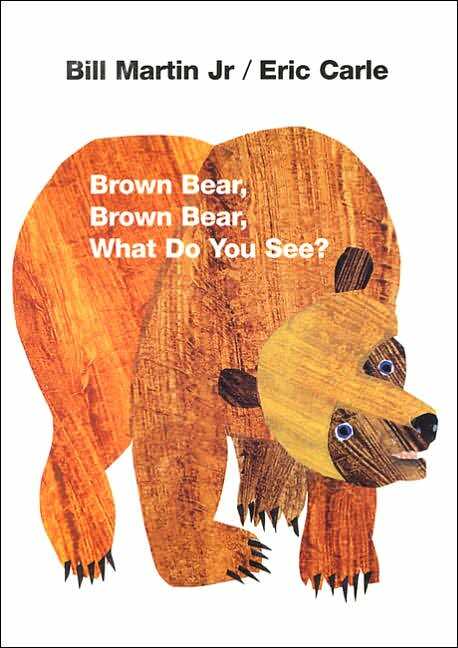 We closed today with a classic: Brown Bear, Brown Bear What Do You See? By Bill Martin Jr., illustrated by Eric Carle. This book was included today because we just got a brand new big book edition at my library. Big books are hard for me to read because they are so big and they make me feel clumsy. Because of that I often have to remind myself to use them. This is a great big book because Carle’s already beautiful illustrations are huge and easy to see. All of the kids were familiar with this book and they enjoyed reading it along with me. We made beautiful rainbows today for our craft. 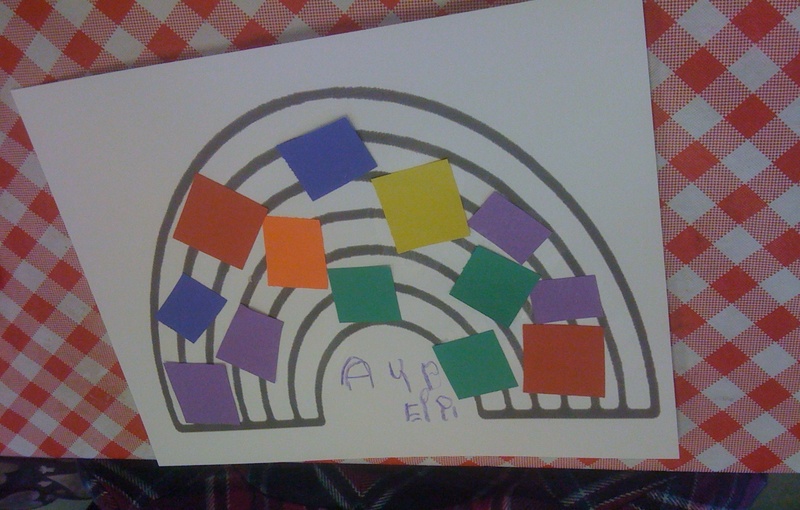 The children were given a rainbow on cardstock, pieces of paper and glue. You could probably subsitute tissue paper if you needed to. It’s very easy! Recently, a co-worker of mine read an article about book bundles in VOYA magazine and implemented it in our library. The idea is to create groupings of books and other materials on a singular theme in order to help patrons find new titles on topics that interest them. She has been doing this with our Young Adult Fiction section for a few months and had great success. As a result, we have decided to expand book bundles to our picture books. Other libraries in our area have also been doing these bundles and calling them Literacy Bundles. What about you? What do you think are the must include themes for our book bundles?